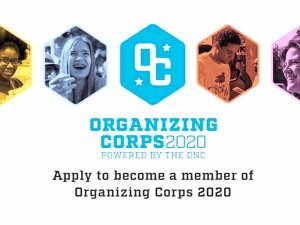 Organizing Corps 2020 has launched! 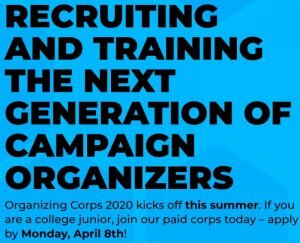 Organizing Corps 2020, an effort to recruit, train and place students in the 2020 presidential election. Please read and pass this information on to your colleagues, friends and relatives who may know potential candidates. Rolling admissions began March 18th and will close April 8, 2019. This is a very cool pipeline program for organizing and development of our future political stars and leaders -- and they get paid! 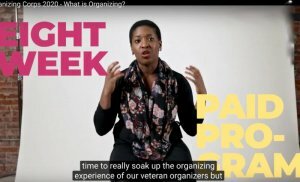 The Low Down: Organizing Corps 2020's summer, 2019 program is an on-the-ground political training run by campaign veterans, and focused on the art and science of being a field organizer in a presidential election. * The eight-week program will kick off with a five-day national training on field, digital organizing and data analytics skills. * For the remaining seven weeks, with the help of a coach, corp members will return to their campuses and communities to put their new political skills to work. * Working with their local Democratic Party, they will continue to develop their leadership, project management and communications skills, while organizing neighborhoods and registering voters. * Earn $4,000 while experiencing the exciting and rewarding field of campaign work! The training period runs from June 10, 2019 to August 2, 2019. Afterwards, corps graduates will receive direct support in applying and transitioning to the 2020 presidential election. Organizing Corps 2020 will recruit students from seven states where Democrats fell short in 2016 and that are crucial in providing a pathway to victory in the 2020 presidential. The program will be implemented in Arizona, Florida, Georgia, Michigan, North Carolina, Pennsylvania and Wisconsin - focusing on students from communities of color who have been traditionally underrepresented among political campaign staff. a part of building the kind of America we all can believe in. It is their future we are fighting for, and in their voice, their vote, and their leadership, lies the future of the Democratic party. DemList is a daily political column and resource dedicated to informing, educating and connecting the Democratic family to the players, politics and the issues. SignUp!